Of course, long ago I have decided that chavismo was a religion. Then I started seeing it as becoming a sect and I think that it is about to become a cult. But I did a mistake in thinking that the the cult leader was Chavez. It might well be Giordani who is the cult leader and Chavez merely a prophet of sorts. Giordani has been in charge of the Venezuelan economy roughly since the start of Chavez era inventing all sorts of "development plans" that went nowhere fast, but at great cost. He presided over devaluations, recessions, spending fueled consumption posing as economic boom, and now over a deep recession. Under his tenure the Venezuelan currency went from about 500 a dollar to 8,000+ a dollar. Inflation control which was his original battle cry is now among the very highest of the world. He tolerated/sponsored a currency control system who gave rise to the biggest corruption scheme that we ever saw in our history as chavista businessmen opened all sorts of brokerage houses to manipulate the PDVSA dollars that normally should have been spent through the budgetary process. To top it off he criminally neglected public infrastructure leaving us with a wrecked highway system and an electricity crisis that will last at least until 2012. And now, with all the damning evidence against him, in absolute proof of his incompetence, he wins the internal political battle, gets to close down the stockbrokers he promoted to manage the parallel dollar market which will bear in chavista public opinion the blame that he should receive alone, and gets to be the lone person in Venezuela fixing the currency value against the reality of the markets. In doing so he basically shuts down the economy for the next few weeks, possibly triggering an inflation tidal wave that might wreck the remains of the private sector without doing anything to shore up the public one. History blesses us with few examples of people who having fulfilled the Peter's Principle get to fulfill it again and again. I was wrong all along, Giordani is the real Guru of chavismo and Chavez merely his gifted disciple. I cannot come up with any other explanation for this divine mystery, which comes complete with sacred texts. Then again it could well be some Machiavellian plan to wreck the economy on purpose to create some sort of crisis to justify suspending September elections. With these crazies who know jail awaits them, all is possible. Caracas Gringo has reached the same conclusion you have. "Crazy? Yes. Stupid? Perhaps Giordani and the other red jackasses defending this insanely destructive action are insanely stupid and Chavez’s obvious rage at the economic implosion of his revolution is provoking irrational responses. But we don’t think that’s the case, though we concede that Giordani is about as close to self-made stupid as they come in this world. 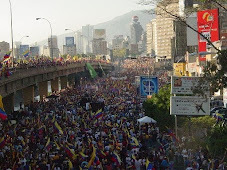 Caracas Gringo believes that we are seeing the acceleration of a deliberate, purposeful strategy conceived and orchestrated with very substantial input from Havana to foster economic collapse and social chaos, in order to justify more aggressive political interventions by the regime including possibly the suspension of the 26 September elections." I have written often enough that I doubted we would reach a September vote. Lately, considering the date I thought that Chavez could not dare anymore change the date. He would have done it a little bit earlier to make it more palatable for international public opinion. But it is all relative: if the government is out of cash, as it seems to be the case, then the political calculations could change. I have to agree with Gringo here. Chavismo wants to scare away the ones who are still in Venezuela. They need to provoke a showdown in the coming months. I agree with Caracas Gringo that the simple goal of Chavez is to weaken the private sector and speed up the government takeover of the whole economy.This being so, the measures taken by Giordani make perfect sense. There is no rocket science here, or even failed rocket science. I was chased out of Cuba, scared out of Venezuela... It is not my fault. I swear. Perhaps Giordani will become famous as the Lysenko of economy.